Runs POST according to diag level value. Runs POST with preset values for diag level and diag verbosity. 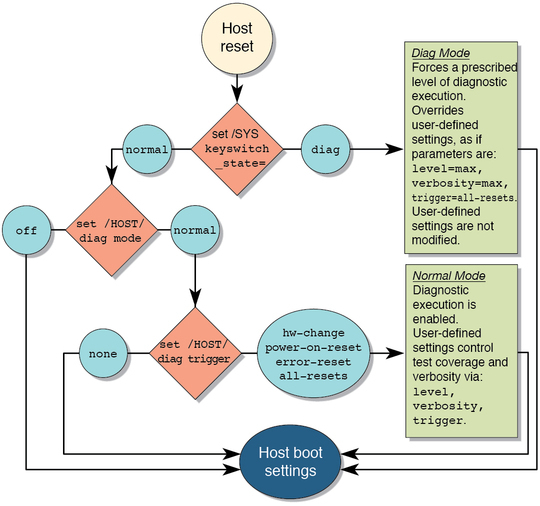 If diag mode = normal, runs all the minimum tests plus extensive processor and memory tests. If diag mode = normal, runs minimum set of tests. Only runs POST for the first power on. The following flowchart illustrates the same set of Oracle ILOM set command variables. The following table shows combinations of Oracle ILOM parameters and associated POST modes. This is the default POST configuration. This configuration tests the system thoroughly and suppresses some of the detailed POST output. POST does not run, resulting in quick system initialization. This configuration is not suggested. POST runs the full spectrum of tests with the maximum output displayed. 1The keyswitch_state parameter, when set to diag, overrides all the other POST variables.